HEY, YOUNG people! Meet Ted Cruz, US senator from Texas, seen in a viral video, cooking bacon with a machine gun and laughing manically. It’s less a policy statement than a ploy for attention, and really, there’s nothing wrong with that. Every politician wants to be where young people are watching — and that isn’t cable news. So Barack Obama deadpans on “Between Two Ferns” to push health care reform. And Cruz, who turns out to be kind of a natural at the hipster-nerd persona, does “Simpsons” impressions on Buzzfeed. Whatevs. The bigger question is whether the quintessential Buzzfeed reader is going to vote — for Cruz, or for anyone else. 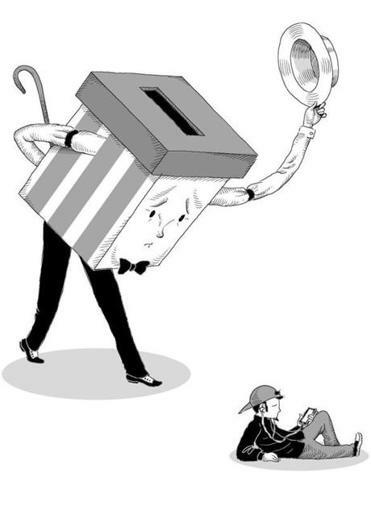 How to mobilize America’s youth is a perennial question; I’ve been covering various efforts to rock the vote, yuk up the vote, and shake the vote out of its stupor since I was a newbie voter myself. The problem is getting worse. Kei Kawashima-Ginsberg, director of CIRCLE, a Tufts-based center that studies civic engagement among young Americans, said the percentage of 18-to-29-year-olds who voted in the 2014 midterm elections was 19.9, the lowest ever recorded, and significantly below the 24 percent who voted in 2010. 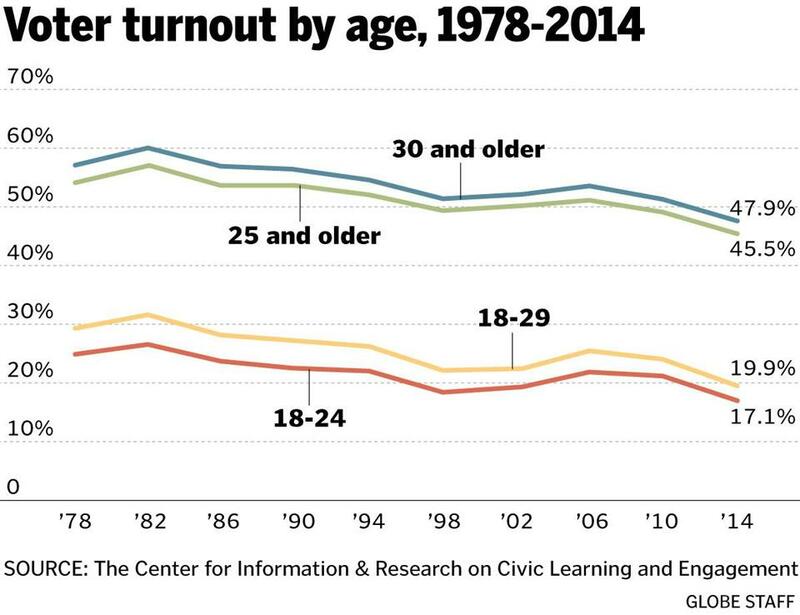 Of course, more people of all ages vote in presidential-election years, so there’s serious potential for that number to rise. CIRCLE identified 12.4 million young voters who were registered in 2014, but didn’t cast ballots. Mobilize enough of them, in enough swing states, and you’re talking about the power to move an election. But reaching young voters won’t be as easy as sharing videos on Facebook, or talking about the cost of college, or hoping that enough of them have settled down with kids. There’s a far bigger barrier than inattention: Mistrust. Every year, Harvard’s Institute of Politics surveys 18-to-29-year-olds across the country about their attitudes toward politics and public service. This year’s survey asked how much millennials trust a range of institutions to “do the right thing” all or most of the time. The president? 36 percent. Congress? 18 percent. Predictable, maybe; Jon Stewart moaned about those people every night. How did we get from fighting for the vote to dismissing it as meaningless? Blame the recession, which has kept so many young people from jobs, homes, and stability. Blame our current politicians, peddling gridlock and attacks. Blame the culture at large, the pox-on-all-houses rhetoric that has helped Donald Trump’s cartoon nihilism take hold. It’s unclear whether any earnest politician can break the spell. Viral videos aren’t going to do it. But the tussles between Black Lives Matter activists and the Hillary Clinton and Bernie Sanders campaigns are an interesting test case. In a private meeting with protesters in New Hampshire last week, Clinton made a practical case for working within the system. “I don’t believe you change hearts,” she said. “I believe you change laws, you change allocation of resources, you change the way systems operate.” The protesters didn’t seem convinced. And if that movement doesn’t lead back to the voting booth? Then we have a much bigger problem. Joanna Weiss can be reached at weiss@globe.com. Follow her on Twitter @JoannaWeiss.